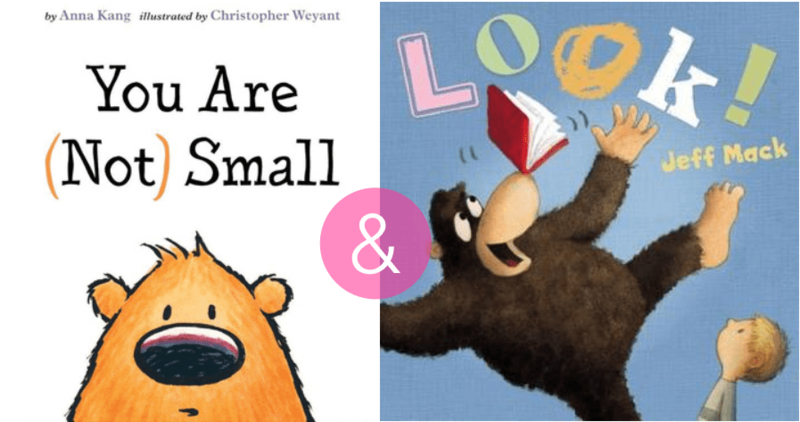 picture book wordplay: you are (not) small & look! Why am I pairing these two (excellent) picture books? They both have language concepts that really shine while not outshining their spirit and heart! 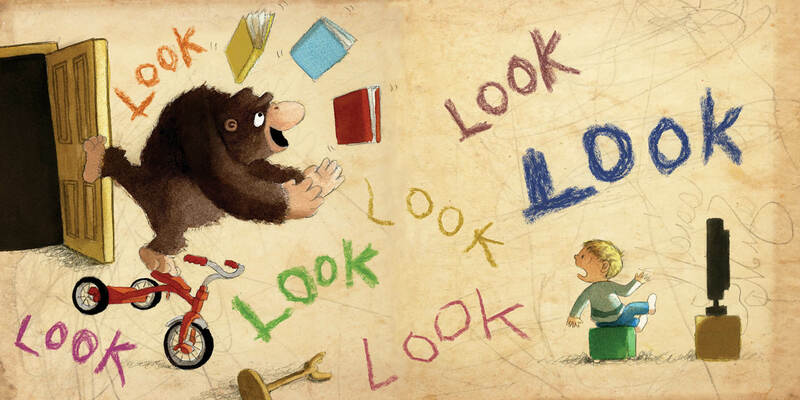 Both are excellent examples of a successful contemporary picture book—spare, clever, funny, AND touching. All that in so few words! LOOK! has only two words! Two words! & You Are (Not) Small has spare language and plays with two words in the little mix: BIG and SMALL. In small packages, both books accomplish a lot. Come see! 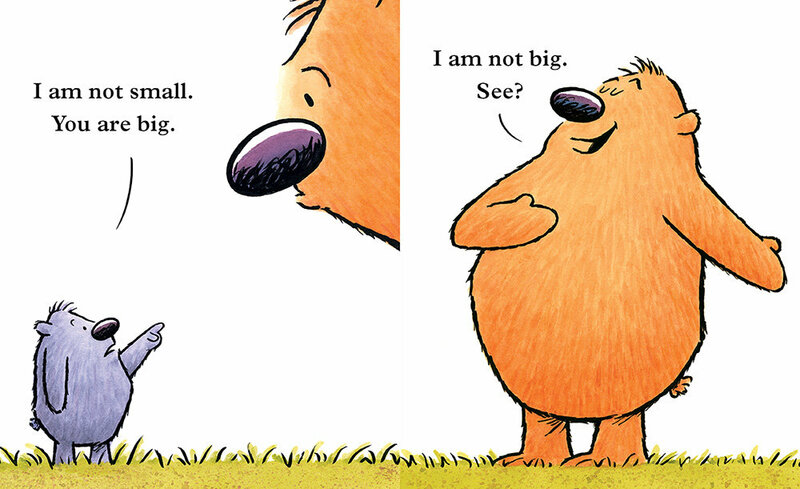 You are (Not) Small by Anna Kang, illustrated by Christopher Weyant. There is a small creature and a big creature. But neither creature believes herself to be respectively small or big. There is evidence given. Arguments break out. Until…other creatures arrive to put everybody’s perspective in perspective. The conclusion is that nobody is small or big. Everybody is small AND big. Which is pretty profound, no? But most of all, for me, the magic I want to point out today is the words. Those two words, amidst the others, are omnipresent, played-around-with opposites. Small. Big. Kang’s experimentation with those words (and Weyant’s visual play) is what makes this one sing for big readers and small ones. This book plays with two words too. The only two words in its pages! LOOK and OUT. But that masterful language makes it. The gorilla says, LOOK. He wants the boy to look, to see his tricks, to spend time with him. But every time the boy looks, there’s a mishap and the gorilla’s pleas and ploys fail. So the boy says, OUT. As in, go. Leave me alone, with my TV show. 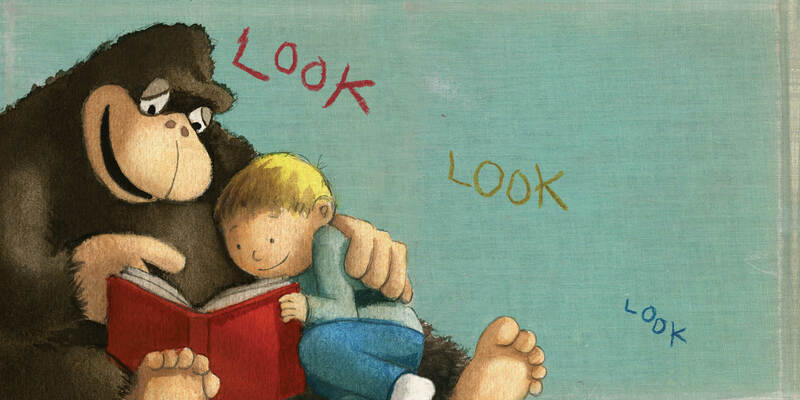 In the end though, don’t worry, gorilla and boy come together, united by something novel to look at together—a book. And that’s when the boy changes and the conclusion is sweet, sweet, sweet. But I used all those words to tell you about it when the book is only two words and a few pictures. 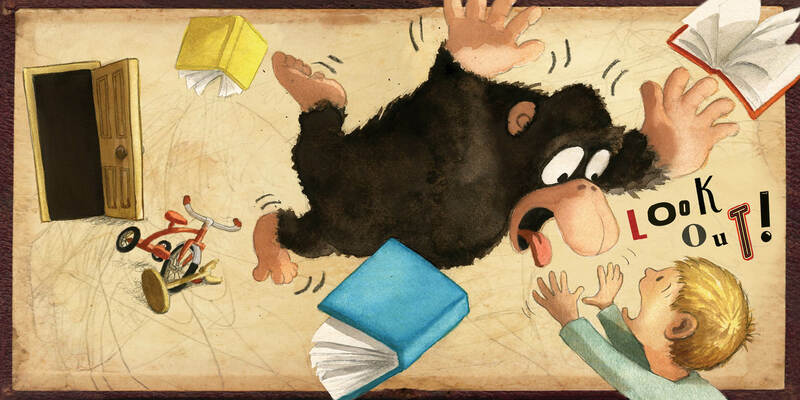 That’s the amazing thing about picture books. Thanks to Penguin Young Readers for Look! images! Any other picture books that play with words like this? read the books, play with words! 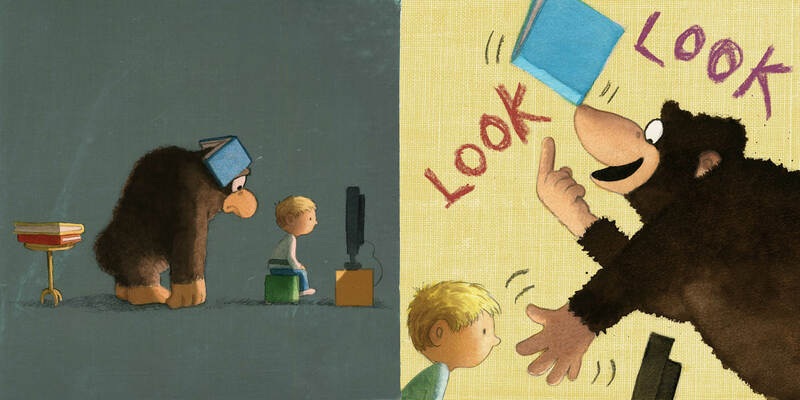 7 Responses to picture book wordplay: you are (not) small & look! Brevity is not my gift! Ha! I do admire authors who are able to entertain with such simplicity. 10 Minutes till Bedtime, by Peggy Rathmann, is one of my favorites. These two are exceptionally brief. 🙂 And thanks for pointing out another one, which I didn’t know. What a great concept! If you get a chance to read 10 Minutes… the illustrations are adorable. The little hamsters have their own little world. My son loved it when he was small. 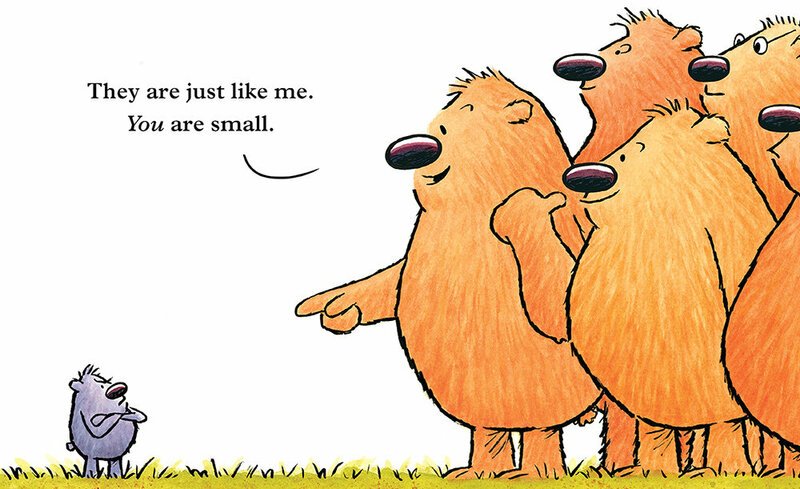 You Are (Not) Small was such a sweet book. I love how you paired these two. Looking forward to reading Look. Yes, it’s amazing how both of these accomplish such sweetness using a technique that I associate more with pure humor. LOOK. The current vogue is the author illustrator in one and minimum text. Two great examples.